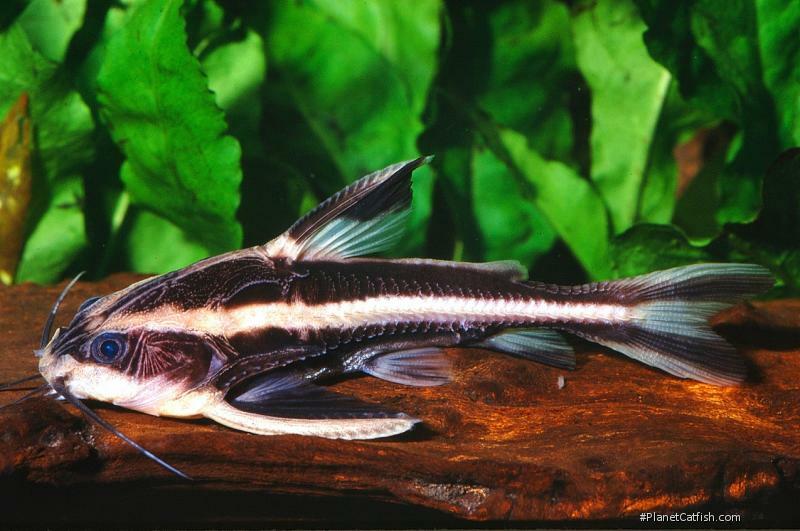 You have to go all the way back to April 1997 to find the last time we featured a representative of this South American family of catfish (Agamyxis pectinifrons). So with humble apologies to all doradid fans, we continue with this fish. Although the price of these fish has increased slightly in relative terms over the last decade and the size of specimens offered for sale has dropped, in my opinion, they remain a very attractive fish for the price. Their main drawback is their extreme nocturnal nature. Raphael cats love to hide from the light and will wedge themselves into almost any dark place to avoid exposure - who needs sunscreen? This unfortunate behaviour means that to cater for these fish correctly you have to give up on being able to view them most of the time, in my mind this adds to the occasion when they are spotted "out and about". One of the difficulties with this natural daytime shyness is a common problem faced by many catfish keepers - heater burns. These fish, if not given sufficient cover, can wedge themselves between the aquarium heater/thermostat and the substrate or aquarium glass. If they are so hidden when the heater comes on then you might be faced with a dead catfish, or at best an unpleasantly scarred fish that will be susceptible to secondary infection. Heater guards are one solution, but if you place the heater far enough above the substrate and supply alternative dark retreats then the fish will oblige by moving home the next time the lights are out. When the lights are out both in the tank and in the room housing the aquarium, you can creep up to the tank and watch these fish go about there nocturnal activities (using a weak torch). If they are hungry you will find them in an almost continuous cruise around the aquarium in search for food. It is easiest to feed these fish at this time, for any food offered will be eaten by the night active fish. However with a little patience and skill you can train them to eat during the day. Assuming that the fish has taken up home in a particular cave or suchlike, put some food at its entrance at a regular time every day. If the fish is hungry enough, it will come out to eat. Eventually the fish will react to you moving the aquarium hood and will come out to feed at any point during the day sometimes even venturing towards the water surface. The image to the side perfectly illustrates the barbed hooks that adorn the flanks of these catfish, they might look quite ornate from a distance, but cause real problems when trying to net these fish. Alternative methods, such as enticing the fish into an appropriately sized PVC pipe and removing both fish & pipe, have to be employed to avoid damage to net, fish and aquarist! Platydoras armatulus are not commercially bred and so all specimens available for sale are wild-caught. With all such shipments, odd balls or "contaminants" can sometimes be found. These are similar species that are often thrown in with the intended species by exporters. They do not necessarily come from the same river or locality, but simply have passed through the same exporters or sometime importers facility. In this way the similar Orinocodoras eigenmanni can sometimes be offered for sale labeled as a Striped Raphael Cat or suchlike. This contaminant is most easily distinguished by its longer, more elongate snout and longer adipose fin. The contrasting white stripes on Platydoras armatulus are also considerably brighter, particularly on youngsters. Both these fish are identical in terms of care and full grown adult size. Type Locality Río Paraná, but not below 27°30'S, South America. Identification This species has been misidentified as Platydoras costatus for decades, only in late 2008 was it recognised as P. armatulus. 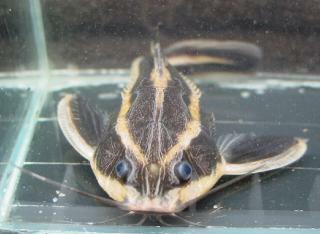 Orinocodoras eigenmanni can sometimes be offered for sale labeled as a Striped Raphael Cat or suchlike. This contaminant is most easily distinguished by its longer, more elongate snout and longer adipose fin. The contrasting white stripes on Platydoras armatulus are also considerably brighter, particularly on youngsters. Sexing Adult females are wider when viewed from above. General Remarks Talking catfishes get their common name from noises they make, mostly at night, by grinding their pectoral fin bone in its "socket". Click here to listen to this species. Distribution Widespread in South America being found in both Amazon and Orinoco basins. Breeding Fry have been found in the aquarium, however spawning behaviour was not observed and is therefore unknown. There are 345 registered keepers, view all "my cats" data.